This past weekend, TreeHacks supported over 600 hackers with food, mentors, hardware and activities including Zumba and a Dish hike – all made possible by the 30 organizers of the event. The team, which is in its second year organizing TreeHacks, began meeting in the summer of 2015 to prepare for this year’s hackathon, building on the experience of running TreeHacks in its inaugural year. In order to provide hackers with all of the support they needed to hack, the team informally split up into three major logistical teams for the event: food, tech support (for during the event itself) and sponsorships. Individual organizers also planned and helped execute a number of new initiatives to make the hacker community more accessible to newcomers, while still engaging veteran coders. Many of these ideas originated from organizers’ individual interests. According to Claire Shu ’19, a freshman organizer recruited in October, the entire team met weekly, with additional meetings for the swarm of smaller projects that helped TreeHacks feel more welcoming to all. After the hackathon started, the team communicated using radios that allowed organizers to contact one another and contribute at all times. This manifested in around-the-clock staffing, as well as the capacity to deal with small crisis situations without affecting hackers noticeably. TreeHacks also debuted two verticals around which participants could center their projects: TreeHacks Health and TreeHacks Social Good. TreeHacks Health was one of the event’s most effective initiatives, and when the hacking ended, 33 out of the 84 total projects were health-related. Sherman Leung ’16 M.S. 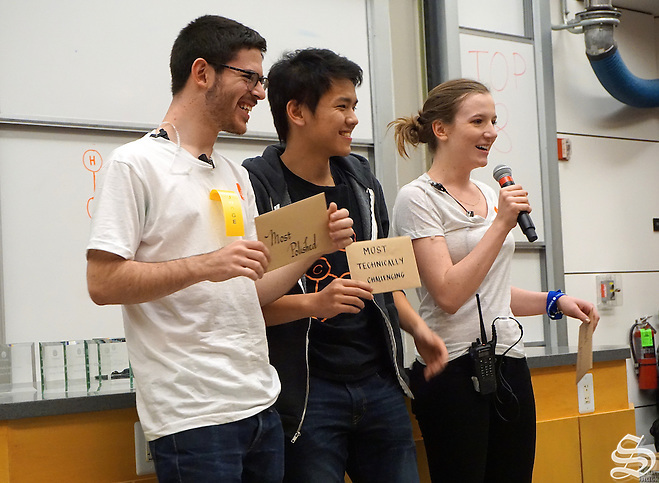 ’16, the director of TreeHacks Health and a co-founder of Stanford Health Innovations in Future Technologies (SHIFT), a student group applying CS to health, was inspired to create a health track after observing a pattern where hackers at other hackathons were often unsure how to make an impact with their work. The track was enhanced by the support of mentors from the SHIFT network of medical professionals, in addition to other healthcare institutions. In addition, a number of industry veterans held a panel on healthcare issues to kick off the event, providing a first-hand perspective of the challenges health hackers would be facing throughout the weekend. Leung explained that he sought to maintain an intimate mentor-hacker partnership as part of the larger vision of hacker inclusivity at TreeHacks. The team decided that mentors would propose projects, which would be prescreened and then offered to hackers as starting points to create partnerships with the supporting mentors. TreeHacks Health also developed a relationship with the Department of Psychiatry, which sponsored the Mental Health Innovation Prize (MHIP) at the hackathon. The effort was spearheaded by student David Lim ’18, who collected ideas from Counseling and Psychological Services (CAPS) and psychiatry professors to consolidate and include in the TreeHacks Health umbrella, taking advantage of the technical talent at the hackathon to create change in the mental health system. “A lot of people share the idea that computers are going to completely change the way psychiatry works, both in making mental healthcare more scalable and in making diagnoses more objective,” Lim said. Lim worked closely with Steven Adelsheim, a clinical professor in psychiatry and behavioral sciences at Stanford and the main organizer and judge for the MHIP. Adelsheim has worked extensively in the Palo Alto community and is interested in supporting and working with college students on applications of CS to mental health. The prize proved successful in luring a handful of teams to tackle big mental health issues through technology. Lim now hopes to encourage more work in this area through further discussions with the psychiatry and CS departments, as well as groups like CS+Social Good. “A lot of experienced hackers commented that this was one of the best-run hackathons they had ever been to and liked the focuses on diversity, healthcare and social good,” he said. Wadsworth spoke about feedback they received during the event. Expo judges Isaac Madan ’15 M.S. ’15 and Shuarya Saluja ’15, who also judged at TreeHacks last year, echoed this sentiment and commented on the structure of the event. Contact Albert Zhang at albertzh ‘at’ stanford.edu. Click here for more stories from TreeHacks 2016.